Rangers return to Premiership action on Friday evening with yet another difficult away game in a hostile environment. This time it will be Easter Road, Edinburgh where they will face a Hibernian side now under new management following the departure of Neil Lennon. Hibs are the one Scottish side that Steven Gerrard has yet to defeat since arriving at Ibrox with two earlier League fixtures both ending all square inside a seven-day period in December with a goalless draw in Leith followed by a 1-1 draw in Glasgow. A late equaliser from former Ranger Darren McGregor cancelling out Alfredo Morelos’ first-half goal. 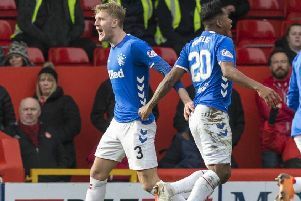 Few would dispute that Rangers should have won both games as Gerrard himself recalled. “I think it will be very similar in many ways at Easter Road with the atmosphere, and I think Hibs will be on the front foot," he said. "They try to play football, they are a positive team - but our last two performances were strong, especially at Easter Road. “I think we were guilty of not taking our chances on our last visit - but you have to give credit to their goalkeeper (Adam Bogdan). He was named man of the match, but our performance was superb and certainly deserved three points. Since that pre-Christmas double-header Hibernian have of course changed managers and are now coached by Paul Heckingbottom. Currently lying sixth in the division with 41 points from 28 games, they have enjoyed a three-match winning sequence since his arrival but last weekend were eliminated from the Scottish Cup by a Celtic side under the interim managership of a certain Neil Lennon. 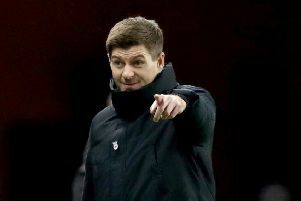 Steven Gerrard was in no doubt that this will be a difficult challenge for his team, regardless of who is in charge of the home side. “It’s a very tough game with a new manager recently coming in with his own style and he’s hit the ground running with some positive results," he said. "They suffered a Scottish Cup setback recently, so I’m sure he’s going to be looking for a reaction - he’ll have them fired up but for us we’re going there with a strong, confident team and we’re going to be looking for maximum points. "Last time we left with one point when we should have gone away with all three. “Paul has his own ideas - he might tweak the system which might look a bit different from the previous times we’ve played them, but we’ll have to wait and see what personnel he puts out against us. “Hibs are a good team with good individuals and they have a good way of playing. It’s another hostile environment for the players - but I think it’s a game the players are really looking forward to. Northern Ireland Internationalist Gareth McAuley is an injury absentee with a hamstring strain whilst Ryan Jack is a doubt, having suffered an ankle knock at Aberdeen on Sunday. Meanwhile Gerrard was relaxed over the transfer speculation raging over multi-million pound offers for leading scorer Morelos. “I’m sure it’s flattering for Alfredo - it shows that he’s in terrific form and in a great place," he said. "I love working with the player, he puts a smile on my face.